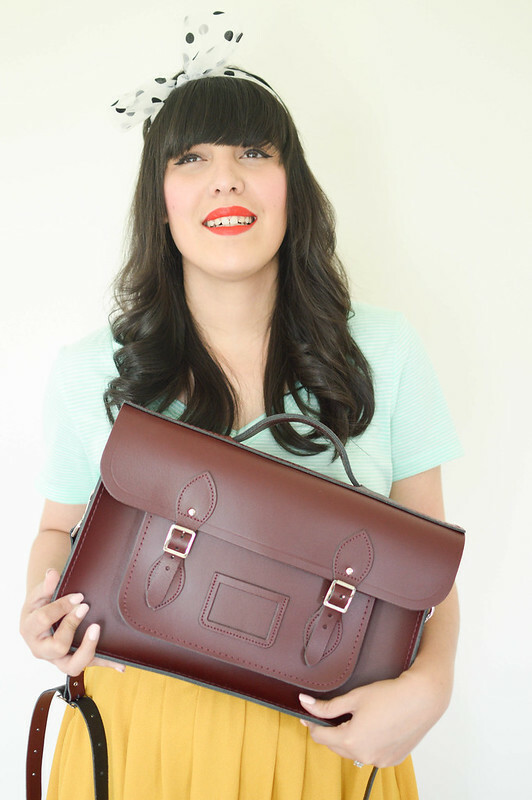 Let me tell you about my Cambridge Satchel…. For the longest time ever I knew I wanted a Cambridge Satchel but always waited for the perfect occasion for me to give this as a gift to myself. Many holidays passed and I still didn’t have my beautiful handbag. I said, after graduation I will get it! Perfect enough, I got a promotion at work where I need my computer at all times. 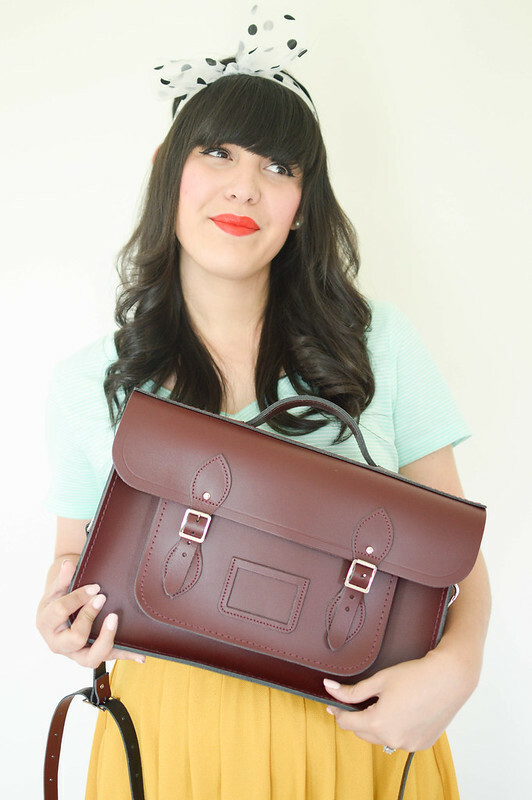 What better than a Cambridge Satchel! 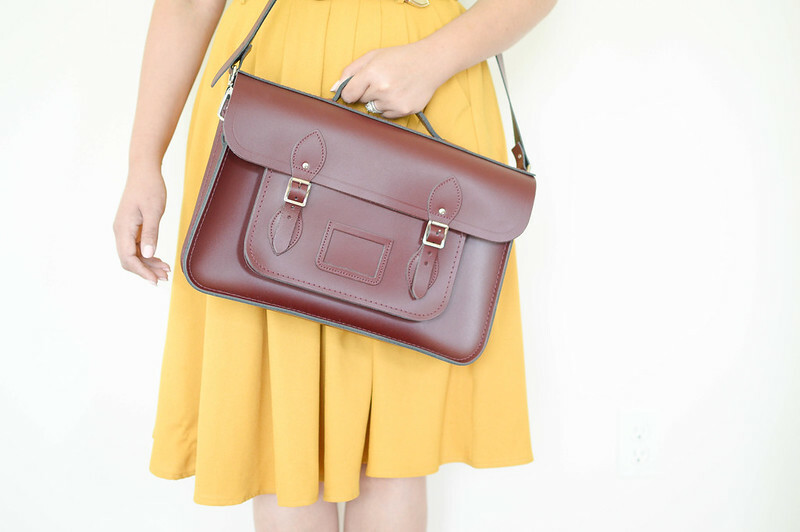 I went to their website and to make this more perfect, they were running a 40% off (head over to Cambridge Satchel so you can get a change on this awesome deal!). 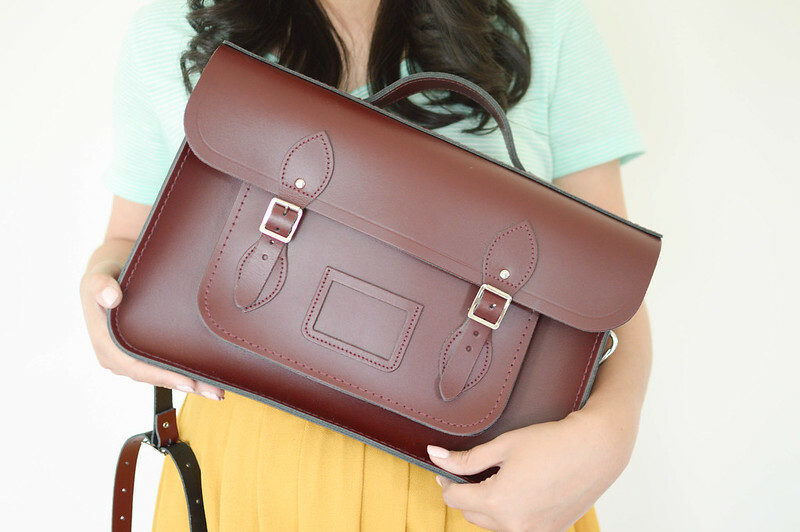 After researching what size would be the most beneficial for me, I decided to get the Leather Batchel in Oxblood Red. I have a 13″ Macbook Air and I was not sure what size was the best to carry my laptop plus paperwork and my daily essentials. 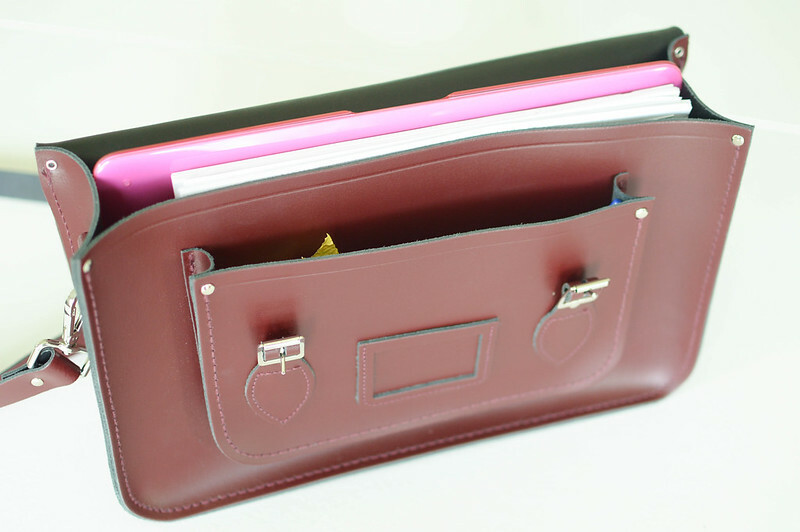 The Leather Batchel is a size 15″ and my laptop fits perfectly inside. I would not go a size small if you want to fit a computer, at least one my size. I chose the Oxblood Red because I didn’t want a plain black or brown or a flashy color I couldn’t wear with everything. I feel this color goes with everything! The leather is pretty thick and sturdy, great quality! The inside is black, perfect for hiding any stain or accidents inside the bag (hopefully it never happens because I’ll cry). It has a handle on top, which is great because this can get heavy on your shoulders sometimes or if you need to grab it out of your car on the go. As a new bag it is pretty stiff and structure so it doesn’t have a lot of stretch inside. It keeps everything organize, but it doesn’t fit everything in the world! One thing that can feel a little bit inconvenient is opening and closing the classic straps. Here is a picture of just a few things I have inside my bag, like my laptop (see how perfectly fits there! ), some paper work and hidden pens in the front pocket. I normally have my laptop charger, small wallet, little daily essentials like chapstick, lipstick, hand sanitizer and mints and my car keys. I love my bag and I know is going last me forever!!! 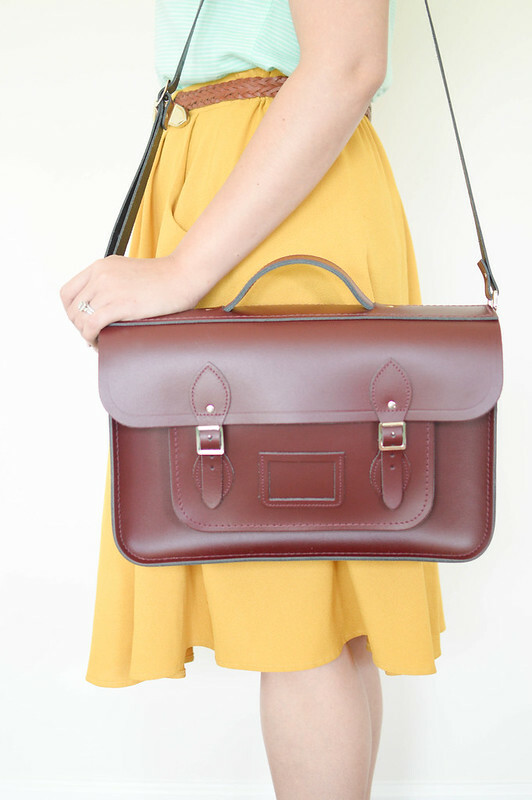 Now I want other Cambridge Satchels styles, different sizes and fun colors!! 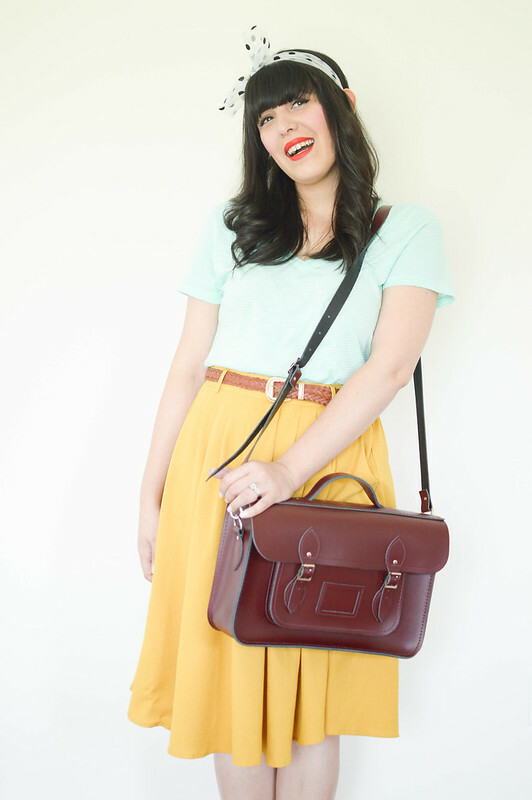 Modcloth has a couple of sizes and beautiful colors as well like this one and this one! And on sale!! I’ve dream of finding a bag like this in a vintage store. When it comes to the leather goods, the older the better. I really love the feel and smell of worn leather.